Carl’s Jr. and Hardee’s Coupon! 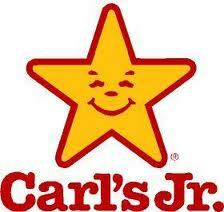 Carl’s Jr. and Hardee’s have coupons for a buy one, get one free deal and other discounts. Today through May 31, 2016, buy one Burrito El Diablo and get another free. The Grilled Burrito El Diablo features Beef, Jalapeño Poppers, Freshly-Prepared Salsa, and Habanero Sauce folded and grilled in a flour tortilla. The buy one, get one free Burrito El Diablo coupon is good today through May 31, 2016. You can get this and other coupons at the links above. 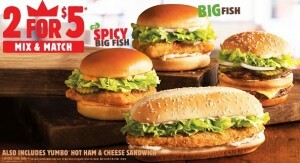 Carl’s Jr. Monday Bunday Returns! MondayBunday Is Back at Carl’s Jr.! Carl’s Jr. has brought back the “MondayBunday” special with a Buy one, get one free on their All-Natural Burger every Monday through February 9, 2015. Click here to get your coupon! Also get coupons for $1 off on other days of the week. Del Taco Offers 2 FREE Grilled Chicken Tacos! 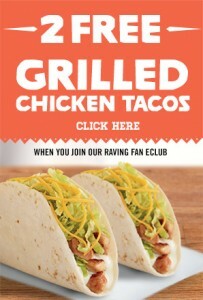 Del Taco is offering 2 FREE Grilled Chicken Tacos when you sign up for their Raving Fan Club! Click here to sign up today!